A newly styled jacket with big, versatile all-weather performance, The North Face's Venture 2 Jacket is ready for all your outdoor excursions. Its seam-sealed DryVent™ 2.5L fabric keeps moisture and the wind at bay while letting you breathe as you move. An adjustable hood lets you seek shelter from dropping rain or blowing wind, and a hem cinch cord closes out drafts. Pit zip venting lets some air in when you need it to cool down. Wear this one for everything from long backcountry journeys to simple in-town trips in the rain. "How much does this jacket weigh.?" "Thank you for you inquiry. 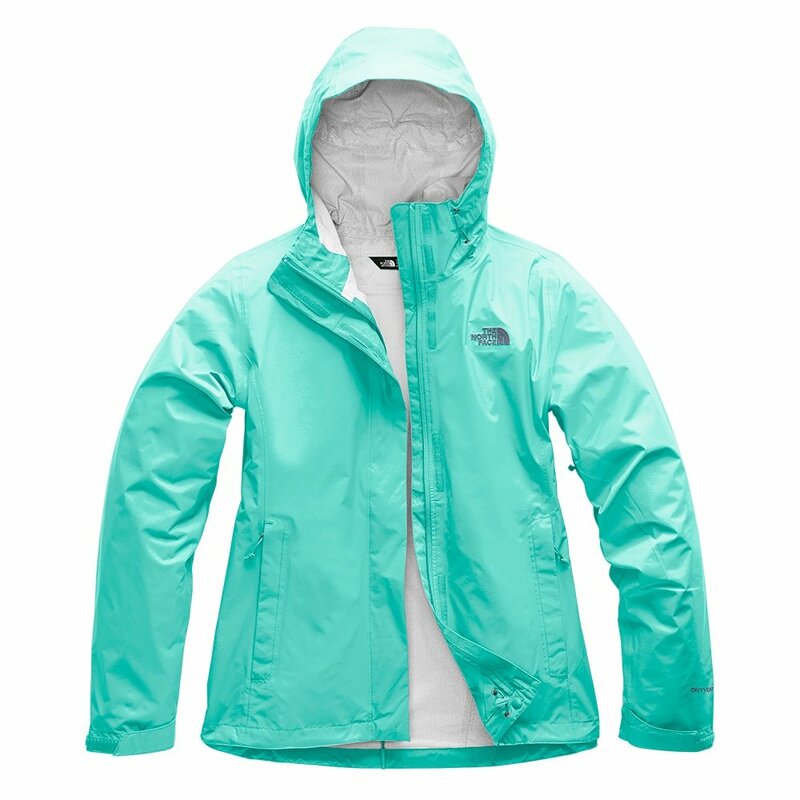 The weight of The North Face Venture 2 Rain Jacket is 10.6 oz. We hope this information helps!" So happy you make plus sizes! So hard to find remotely functional clothing in plus sizes! Fat women leave the house too! I was thrilled to find a raincoat in my size that was waterproof, breathable, lightweight, and had pit zips. It was even a gorgeous purple colour! I love that the hood has a slightly stiffened brim and is adjustable, although I still haven't figured out how you secure I love that it packs into its own pocket. I love that the sleeves are not miles too long for my 5'2" self and have velcro to tighten around the wrist anyway. I love that it is as thin and cool as it could possibly be, so it doesn't feel like torture to put on in the summer. I just took it on a canoe trip where it and I both fell in the water. Even putting it on over wet clothes, it dried within minutes. I was skeptical about the breathability, but I was cool and comfortable and the fabric never felt clammy on my skin. It's nice that you can adjust the bottom drawstring from inside the righthand pocket, so you don't have to unzip to tighten, even though the fit will never allow me to use this feature. If I could have everything I wished for, it would be a bit looser through the hips (I'm about two sizes bigger in the hips than through the shoulders, and I won't be able to zip this with a sweater on), would have longer/more vents (including a back one) and maybe have mesh in those to keep them from gaping too much when unzipped, have a two-way main zipper, and have at least one zippered pocket (although the current pockets are very deep and well-shaped to feel secure). It would also come in even more sizes. Although I found one that worked for me, there are still several people in my life who can't get rain gear for love or money. I bought this jacket to protect against the rain while hiking the Camino de Santiago. I needed a compact jacket that would be rain proof for the days it might rain. I've wore this jacket 4 days on the Camino including rain and thunderstorms and it doesn't hold up. After the first hour it leaks rain and I'm not sure how. At first I thought it was sweat but two days in a row I wore it and it drenched my shirt. The lifetime guarantee only works for the first 60 days so unfortunately I can't return it. I just hope there will be no rain on the horizon the rest of my trip. Love this jacket. This was a replacement for an older model of similar jacket. Very comfortable. Love the new colors. Wanted a very lightweight, breathable rain jacket for my upcoming walk on the Camino de Santiago in Spain - this will work great! Seems to be waterproof. Comfortable, light, breathable. I wore this jacket out in the rain this week, for the first time, and it seems to be waterproof! Fits very well and does the job. Fits well and looks very pretty. I really love this jacket. It's lightweight and very stylish. I wear this jacket to festivals. Breathable material which is great when it's humid and raining. I've been looking for a rain jacket that looked great and this was the one! It looks stylish, and I love how it's not short or boxy. Really good jacket. It was a gift to my girlfriend and she loves it. Really good fit as well. Love it ! Perfect for all weather! Looks really nice and feel comfortable. Great for the raining weather! I got this for my mother. She absolutely loves it! She has wanted a rain coat for a while; I finally got her one and it is the best decision I have ever made. I bought this item for hiking but now that I know how it looks on I think I'm definitely going to wear it for casual use as well because it's a cute jacket! Nice product! Fits well; not restricting. I wish the hood was a bit bigger/deeper so it would stay on your head better. I would recommed this jacket for spring/summer wear! Get lightweight jacket, use playing golf!!! So unbelievably content with this purchase! So i purchased this jacket based on my significant other's recommendation since we're hiking up Mt. Herard out in Colorado in a few weeks. Needless to say, i'm so happy i bought this ! I'm 5'1 and weigh 110lbs, chest size 32c. i purchased an XS. I was so afraid this jacket was going to be extremely fitted but once it arrived i could immediately tell it wasn't going to be that way at all. i'm petite so it's a tad roomy but i'm fine with that bc now i definitely have the option to layer it when the cooler weather hits but the jacket by itself is still so comfortable and fits so nicely and is so lightweight. The only "dislike" would be the arm length but i have pretty short arms so this tends to be the case with a lot of jackets.... Fortunately the velcro at the wrists of the sleeves fixes that length issue entirely ! (: i also took that custom sizing test to see what i would be and it told me i should get a Small... which would've been massive on me. Glad i listened to my gut and went with the XS ! But overall i highly recommend this product if you want something that's functional/practical for almost anywhere except the extreme cold. I just but this jacket after some reasearch. I was looking for something light weight and waterproof but still good looking. And I found it! Yesterday I got into heavy rain and thanks to the jacket I stayed dry!! Would definitely recommend it! I love this rain jacket! It's exactly what I was looking for in a rain/wind jacket. I'm able to wear sweaters under the jacket easily in cooler weather.